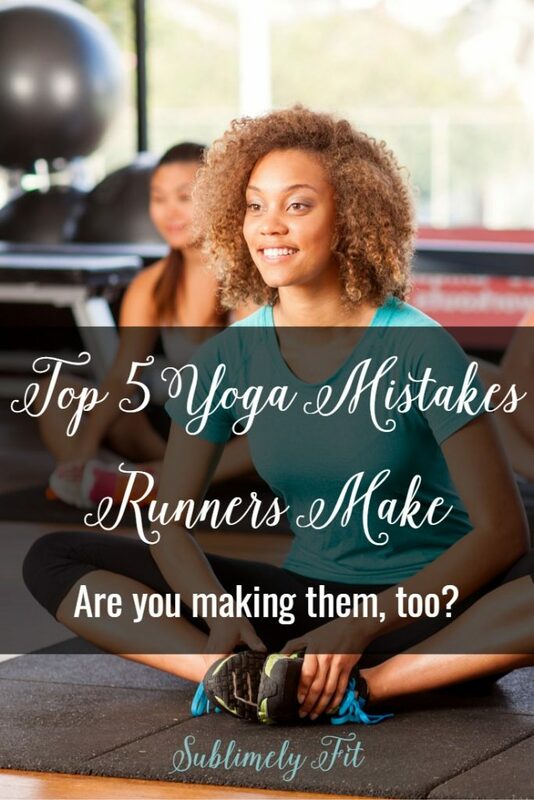 Over the past few years, as a yoga teacher and running coach, I’ve taught yoga to many, many runners, and I’ve seen runners fall victim to the same makes over and over. So, my goal for this post is to help you avoid making common mistakes so you can get the most out of your new yoga practice. Many runners get used to the idea of pushing hard to get the most out of their workouts. Running speed intervals? Push hard at the end to build speed. Finishing your weekly long run? Push hard to finish strong and build endurance. Runners get used to giving 100% to reach their goals–getting that PR, placing in their age group, and so on. However, pushing too hard in yoga is counterproductive, and can easily lead to injury. If you stretch a muscle too far, you could cause it to tear, or even cause damage to the tendons attaching that muscle to bone. I’ve seen many runners straining to get into hip openers that they’re simply to tight to do, instead of taking the suggested modifications. Be smart and listen to your body. Find the right amount of stretch in your muscles and no more. So many runners are afraid to try yoga because they think they’re not flexible enough, or they get discouraged because they’re not as bendy as the yogi at the front of the class who’s been practicing yoga for years. If this sounds like you, I have good news: yoga isn’t about being flexible. The best thing you can do while practicing yoga is to find the pose that fits your body, and to understand that we’re all built differently. Part of the beauty of yoga is celebrating and accepting that we’re all in different places, even day to day. Remember to focus on yourself and what you feel in your body—that’s more important than turning yourself into a human pretzel. To clarify, there’s not necessarily a wrong type or style of yoga for runners. But there are certainly wrong times for runners to be doing certain styles of yoga. A vigorous, heated yoga class like some types of vinyasa flow and power yoga classes, can take a lot out of you, especially if you’re new to yoga or you’re not acclimated to the heat. If you combine the stress of a tough yoga class with the stress of training, it can be too much, leaving you sick, injured, or both. Treat yoga like you would any other style of cross training and take it easy on your easy days. Practicing yoga poses can do a lot for runners. You’ll build strength in both you muscles used directly in running, like the quadriceps, and in muscles that are used to stabilize your body as you run. In addition, stretching to help maintain a good range of motion can help you resist injuries that stem from one side of your body being more flexible than the other. But, yoga will give you more than just a good workout and a good stretch. First, yoga breathing, or pranayama, is wonderful for practicing breath control, which you can directly apply to your running. Struggling to catch your breath during a tough run? Come back to the skills you learned in your yoga class and focus on taking deep breaths in and out. The more time you spend being conscious of your breath, the easier it is to control. As you build your yoga practice, you’ll also learn to control the thoughts in your head, practicing quieting your mind. These meditation tools you’ll learn in class will help you tremendously as a runner. (Read more about meditation for runners.) Runners can use meditation and similar mental tricks to help quiet negative thoughts that come up in their heads, like “I can’t do this,” or “This is too hard.” Your mind will give up before your body does, so learning to control your thoughts is an invaluable tool for runners to have. Just like you won’t become a good runner if you run twice this week, then take the next two weeks off, only to run once the third week, and then take some time off after that. Consistency is key with yoga, just like it is with running. This is particularly true if you’re hoping to build flexibility. Stretching every now and then won’t help you open up your tight muscles. Make the commitment to practice yoga consistently, at least two or three times a week, even if it’s just a short 10 minute session. The more you practice, the better you’ll feel. Runners, are you ready to get started on your yoga journey? Be sure to sign up for my free 7 day Yoga for Runners Challenge! « When Should Runners Start to Do Yoga? I’m guilty of 1, 2 and 5 for sure. I’m getting better with consistency though! Yoga has made me such a better runner. Being present in my miles. Breathing. Improved mindset. slowing down and listening to my body. Good tips! I’ve definitely been guilty of #1. Thus my overstretched hamstring a while back! I think we also tend to overstretch muscles and tendons that are bothering us instead of just leaving them alone! I totally am guilty of not being consistent. I love yoga when I do it but get side tracked sometimes when trying to fit in other workouts. I need to make more time for my yoga practice – it really does help. I think most runners miss out on the mental benefits of yoga. The breathing and the meditation have been as beneficial to me as the actualy poses! I’d say not being consistent is a big one for me! I need to push harder to get to classes, even though I do it at home the classes are better.